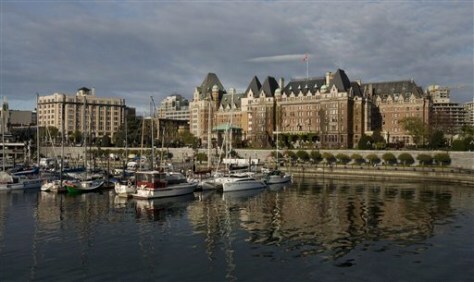 This photo taken May 4, 2008 shows The Fairmont Empress Hotel at the Inner Harbour in downtown Victoria, British Columbia, Canada. For years, the British Columbia capital of Victoria has dumped tens of millions of gallons of raw sewage every day into the waters separating Washington state and Vancouver Island. Regional politicians last week approved a $1.2 billion plan to build four treatment plants to handle about 34 million gallons of raw sewage that Victoria and six suburbs pump into the Strait of Juan de Fuca each day. The province ordered the plants to be online by 2016, Andy Orr, a spokesman for the district said.